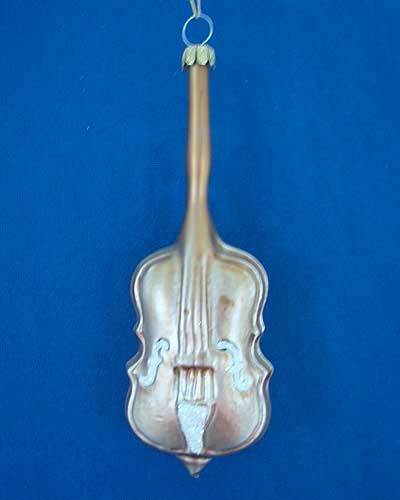 Made by Michael Haberland in Lauscha, Germany, this bass fiddle is created from crystal tubing, blown into a two-part mold, hand-silvered and handprinted. 2018 Fiddle is White with a special "ice glass" finish. Lauscha is the birthplace of glass Christmas ornaments, and the Haberland family has been hand crafting beautiful ornaments for three generations. Totally traditional design. Comes with an authenticity tag proclaiming it's European heritage and describing the Haberland glass tradition. Now in stock! 16 cm./6.29"